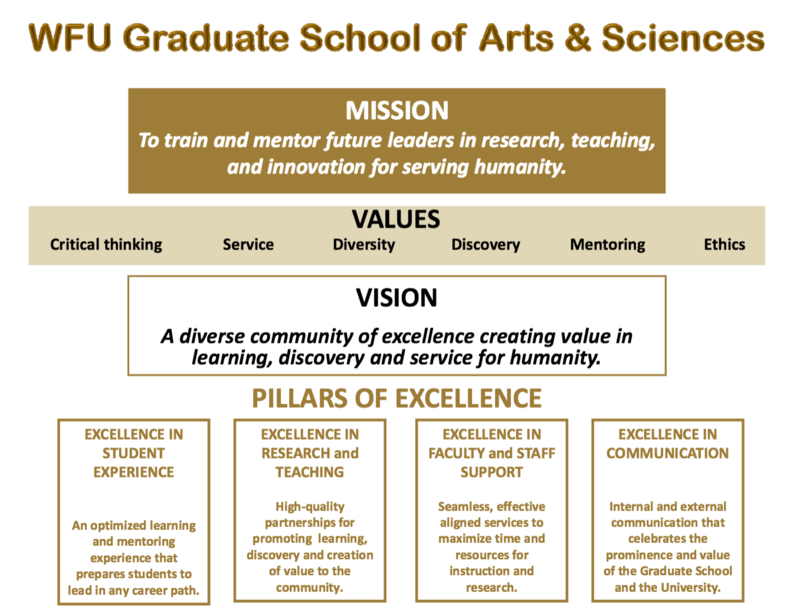 The mission of the WFU Graduate School of Arts and Sciences is to train and mentor future leaders in research, teaching and innovation for serving humanity. This embodies the Graduate School’s vital role as an engine of discovery that fuels the nation’s scholarly and creative enterprise. The Graduate School contributes to the academic reputation of the university by educating the next generation of teachers and scholars and by providing mentors and role models for educating undergraduates. A strong graduate program also helps support faculty research and is critical for faculty recruitment and retention. We seek to instill in our students a sense of professionalism, which includes the ethical behavior inherent in their professional role, as well as respect for their colleagues, their field, and for society as a whole. We want our students to be critical, independent thinkers and good citizens. They should be motivated to apply their scholastic efforts to enlighten and improve the well being of society. Thus the Graduate School is a key link for collaboration between departments and schools and for achieving WFU’s goal of becoming a collegiate university and major academic medical center. Our values are steadfast and consist of critical thinking, service, diversity, discovery, mentoring, and ethics. These are integral to all our activities in the classroom, the laboratory or other research environments, the broader communities of which we are a part. Our vision is for the Graduate School to be a diverse community of excellence. Student experience, to create an optimized learning and mentoring experience that prepares students to lead in any career path. Research, to provide high-quality research partnerships for promoting innovation, discovery and creation of value to the community. Faculty and staff support, to enable seamless, effective, aligned services for maximizing time and resources for instruction and research. Internal and external communication that celebrates the prominence and value of the Graduate School and the University.